October is an emotionally engrossing film from its first scene to the last one and does not peter out until the screen goes black, something a very few movies manage to do nowadays. Dan (Varun Dhawan), who is always lost in his own world, is a hotel management intern at one of the five star hotels in Delhi. Most of his college friends, including Shiuli Iyer (Banita Sandhu), are also interning at the same hotel. It was the New Year eve when something unexpected happens and Shiuli ends up in hospital, fighting for her dear life. Shiuli's condition changes Dan's whole life forever thereupon. What happens next, you can find out by watching the film in theatres. Varun Dhawan is a brilliant actor but, sadly, he is only known for his comic-capers. Badlapur was a good change, but then the actor again went back to doing what he is always good at - comedy. October comes as a complete surprise wherein he showcases a different side of his acting prowess. He comes out of his comfort zone like a boss and stuns with his impassioned act. Here, Varun plays an emotionally-charged character who is ready to go all out to be with the girl initially he has no inkling about her liking for him and vice versa. Even for a single second, you will not see him go overboard. He remains in his character throughout the film, and by the time the credits roll, you find yourself in love with Dan. Believe us, Varun Dhawan has delivered his career's best performance in October. Talking about debutante Banita Sandhu, the actress plays her part perfectly well. She does justice to whatever she has been given to perform in the movie. She looks beautiful and emotes a lot through her eyes. Actress Gitanjali Rao, who plays Shiuli's mother, also impresses with her performance. Other actors in the supporting cast also lend their full support. Think about some of the unforgettable films of this decade and Vicky Donor and Piku do crop up in our mind. So, what made these films special? The story? Performances? Or the directorial skills of the man calling the shots? Well, it could surely not be the magic created only by one thing. It has to be a blend of everything in perfect measures. After giving us aforementioned beautiful films, filmmaker Shoojit Sircar is now presenting us his new movie October, in the month of April. After watching his latest offering, you will know how perfectly he has justified the title of the film. October is a beautiful movie that stays with you for long. Filled with emotions, well-placed humor and love, the movie works because it has all the ingredients which have made Sircar’s previous films click with the audience – story, performances and competent direction. Sircar gets best out of his leading man Varun Dhawan and makes his do things which we generally do not associate with the actor. October belongs to its writer Juhi Chaturvedi as much as it belongs to Sircar. Juhi has created some unforgettable scenes in the movie, which create a deep impact. Her writing is simple and has a sea of emotions running parallel. However, the screenplay of the film should have been more refined. With October, Sircar makes you sit back and enjoy the ride and by the time the film ends and you come out of the hall, you feel a deluge of emotions swirling around you. October is a very crisp film and the whole credit for its crispness goes to its editor who ensures it that there are not unnecessary scenes to drag the narrative. Cinematography of the movie is also good. There are some landscape shots of Kullu in the second half which take your breath away. Delhi has been captured beautifully in the movie. Another plus point of the film is its background score which flows well with the melancholic narrative. Production design is also good. You don't see any song in October on screen but the soundtrack of the film boasts of some good melodies. Its music is as intense and deep as the whole film is. Well-known music composer Shantanu Moitra scores three songs for the soundtrack while Abhishek Arora and Anupam Roy get an opportunity to compose one song each. The song ‘Teher Ja’ by Abhishek Arora in the voice of Armaan Malik is a romantic urban number that you would like to hear again and again. The October theme piece by Shantanu Moitra is an outstanding composition. If you have suffered heartbreak recently, you are going to love this song even more. 'Tab Bhi Tu' is a sad love song by Rahat Fateh Ali Khan. It could have been a far better song that what it is. Other songs in the album are passable. Overall, the music of the October is such that grows on you over the period of some time, if you listen to it again and again. Watch this film if you want to see Varun Dhawan in a completely new avatar. He has impressed us with his great comic timing in many films since making his debut. Here, he tries to woo your heart with his simple but subtle performance that has an avalanche of emotions blended magically well. The actor delivers the most sincere performance of his career so far. It should not be missed at any cost. 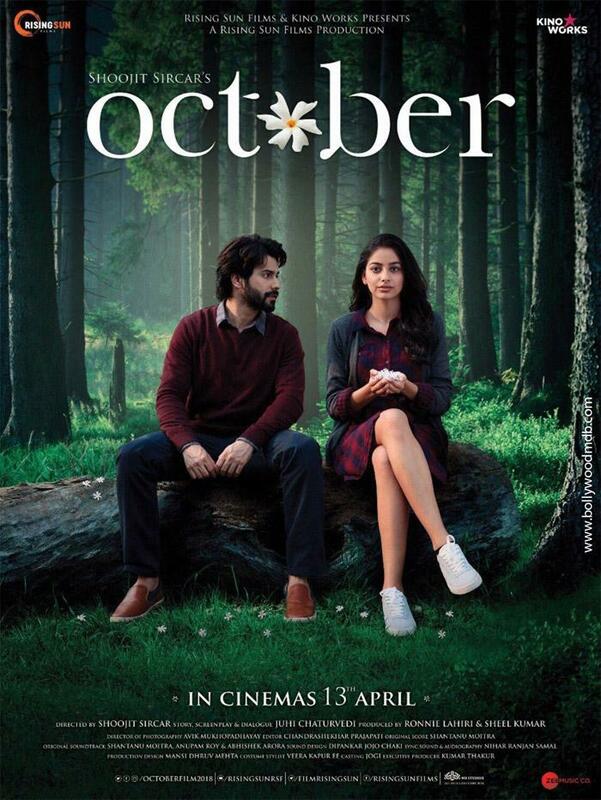 Shoojit Sircar is another reason why October deserves a watch in cinemas. After a slow start, Varun Dhawan’s October paced up on weekends and collected Rs. 20.25 in 3 days!